Moneypenny: Making a Great Place to Work. Born in 2000, Moneypenny leads the UK Telephone Answering Service and Outsourced Switchboard market with respect to its size, quality of service and technology – looking after more calls for more businesses than any other company. Central to the company’s service offering is its people. Download PDF version: Moneypenny Case Study. Employing over 500 bright, happy and capable individuals, Moneypenny aims to build a fun, supportive and fulfilled team that enjoys working together to make the company grow and develop. Having been listed in the Sunday Times ‘Best Companies to Work for’ over the past four years, its successful growth has been achieved by staying true to its founding principles of ‘treat others as you would want to be treated’. 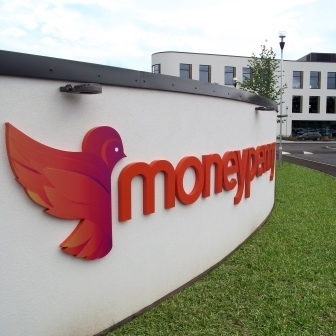 With a purpose-built development on the cards in its home town of Wrexham, Wales; Moneypenny had a 10-acre plot with which to design a new office space which could house up to 1,000 employees. However, unlike many traditional office projects of this nature; Moneypenny approached the building design in a very unique way. The £15m headquarters’ top line brief was to create a development which would literally ‘put a smile on people’s faces’. Given the nature of the telephone and switchboard operations, this presented an unprecedented design challenge from an acoustic perspective. How could a truly open plan space be achieved in a high density, high call volume environment, where call quality was crucial to business performance and customer service? 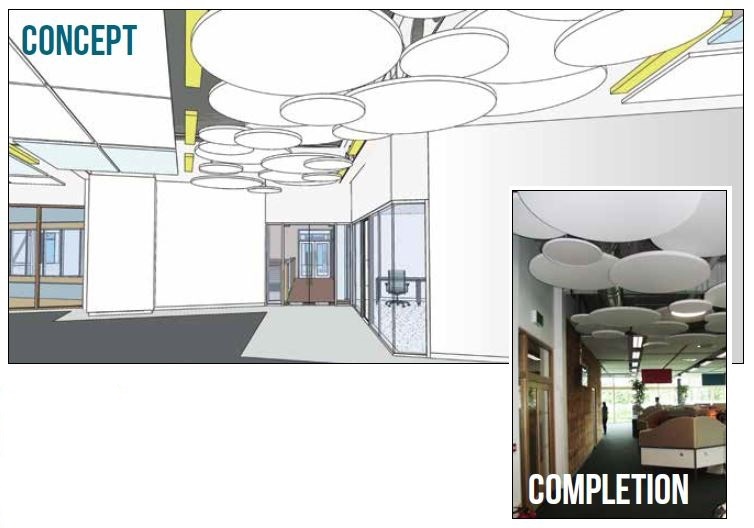 The open plan brief ruled out the standard approaches used to control acoustics in volume call environments: “In previous offices we went to great lengths to avoid the use of the commonly used ‘booths’, but working within the constraints of existing spaces sometimes made this extremely challenging with retrofit solutions. With a purpose-built development, we had the opportunity to get the design exactly right for the environment we wanted to create, and it categorically had to support open plan working, accommodate a high density of staff and not compromise quality,” explains Ed. Based on the design parameters, the architects investigated a range of potential wall and ceiling treatments which could achieve the necessary reduction in reverberation times – but also provide a highly decorative finish which Moneypenny could stylise according the various team working zones. The ideal solution was found in the CMS SuperPhon range from CMS Danskin Acoustics. Working closely with the architects, CMS Danskin Acoustics undertook a completely bespoke design process which balanced aesthetics with installation practicalities. For example, some panels were installed with a demountable fixing system to allow access to services behind ceiling rafts. Moreover, in other areas radii was applied to the corner panels so that they could follow the curvature of the wall. A staggering 2,500 wall panels were installed over the two operational storeys of the new building, with a total contract value of £200k. From an aesthetic perspective, CMS Danskin Acoustics delivered a highly varied range of finishes and colours, from funky and bright patterns through to highly creative gooseberry fruit prints for Ed’s own office. In just a few weeks since the new site opened its doors to the Moneypenny team, the impact of the SuperPhon sound absorption on the working environment has been observed by all who enter the building: “The building is proving to be everything that we dreamed it would be. We’ve got the sound quality we need to provide the quality service our business has been built upon, while creating a truly great place to work. “Without exception our call handling times are already up, team productivity is up – but any background noise is turned right down,” continues Ed. Based on the success of this first phase of the development, Moneypenny intends to keep the tried and tested SuperPhon specification as it moves forward with plans to open up the third storey of the building.